Many of the organizations we work with are pursuing some kind of ‘silver bullet’ solution for their various new product development challenges. The truth is that there is no single solution. Instead, a well-run new product development organization is a complex and demanding endeavor. This is probably why so many organizations struggle with organic growth as their primary growth strategy. Many companies discover that cost-cutting and acquisitions are easier than obtaining successful organic growth. It is not for the faint of heart – it takes commitment to purpose and a well-formed plan to build an organization through sustainable new product development, as opposed to a series of one-off projects. To begin with, you must have unwavering support from your executive team in the form of leadership and participation in the development, execution and maintenance of the NPD system. They must insure the NPD strategies align with and deliver on the business strategy, provide the appropriate types and levels of resources, and perhaps most important, they must model the behaviors required for the NPD system to work. We’ve seen organizations attempt to build a sustainable NPD system, only to have it torpedoed by executives who feel the system does not apply to them. 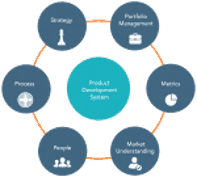 Once you have the executive team buy-in it is time to meet the challenge of developing and implementing your new product development system. Too often we see companies try to fix the new product development system by focusing on just the development process – the specific activities, inputs and outputs required to create a new product. Rarely does this work because of the interdependencies of the different elements in the new product development system. A New Product Development System is just that: a system. All the elements must support and reinforce each other in order for the system to generate new products in as effective and efficient a manner as possible. The elements are essentially the same for every organization, but the way in which the elements are defined, the way they link together and the specific tools, processes and skills utilized will differ by organization. With our proprietary NPD Elements© methodology, we create an integrated approach for improving your new product development system. NPD Elements include: NPD strategies, process, portfolio management, organization/team /culture, market understanding and NPD metrics. Business strategy provides the direction for new product development and the innovation strategy addresses how the organization, as a whole, will use and support innovation in delivering on the business strategy. Together, the business and innovation strategies drive the product, market, technology and platform strategies, and they drive the nature of organization change required. The areas impacted can include the other elements of the NPD system: organization structure/teams/culture, process, portfolio management, market understanding and metrics. The best NPD processes are robust with concurrent, iterative activities and test-feedback loops built in. Another key feature is directing the nature of activities and checkpoints based on project type, size and/or risk level. Development processes frequently follow a phased and gated path in order to ensure nothing is missed and risk is appropriately managed. The very early stages of new product development addressing the search and identification of opportunities tend to fare poorly in such a circumscribed methodology. We utilize a more flexible, yet rigorous innovation framework for directing the early stages of new product development. It is essential to define, select and chose the best opportunities for your organization as defined by your New Product Development Strategy. Unstructured, ad hoc planning in the pursuit of nimbleness and real-time exploitation of opportunities merely generates ever-changing priorities, long decision-making cycles, and precious time wasted in endless project prioritization meetings. It is imperative to have a portfolio management process that evaluates your current and potential new product development projects, that allows for the comparison of the relative value of these projects, supports selection of the best projects within the organization’s resource constraints, and periodically reviews the portfolio to ensure it is on-track for delivering the organization’s strategic objectives. Your organizational structure has to support your new product development process. Do you have the right types of teams established to support your new product development efforts? For example, cross-functional teams working together toward a common goal tend to be more effective and efficient than functional areas guided by different goals and metrics. And, many organizations find product managers an invaluable resource for planning and managing product categories, not just to handle marketing but to take a more strategic stance and guide a product category to maximal bottom line contribution. The ‘softer’ dimensions that define the behavioral environment of the firm—the firm’s organizational culture and management commitment—can have an important impact on the outcome of complex and risky new product development efforts. Undervaluing the human side of innovation is a common mistake within organizations. It takes time to embrace collective goals, understand the strengths of team members, and to establish trust to develop truly great products. Most organizations are best served by developing products based on important, unmet customer needs. This ensures there is a market for the new product. Some innovators have found success by following a personal vision of something entirely new, or by inventing a technology and then trying to find a matching need, but this approach is riskier and harder. Understanding customer needs is an art and science that goes beyond just one technique or methodology. Depending on your innovation strategy, continuous monitoring of evolving needs and technologies may be critical, or deep understanding of the current needs of a niche may be necessary. Each company and situation is different and requires different tools and methods. The art is in understanding the situation and the science is in the selection and application of solutions. Quite simply, “What gets measured gets done”. The appropriate metrics will depend on the various strategies and goals, the types of innovations pursued, the desired organizational behaviors, etc. Be sure to integrate important measures at the project, team and company level that encourage the appropriate behavior and results. Making the new product development system work smoothly, efficiently, effectively requires managing and optimizing many moving parts. So, there is no silver bullet, just a lot of hard work, commitment and smarts.